Herb Silverman is one of the most congenial atheists anyone could ever want to meet. Atheists have a reputation for being abrasive, pugnacious, and scornful. But Silverman isn’t like that at all. He’s a breath of fresh air. 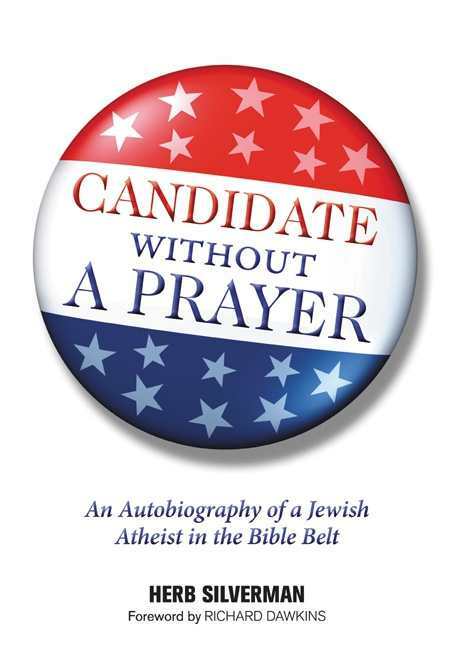 Candidate Without a Prayer tells Silverman’s life story, from his Orthodox Jewish boyhood through the study of mathematics and his eventual campaign for governor of South Carolina, a campaign he never expected to win. He ran for office only because the state constitution said that anyone who denied the existence of “the Supreme Being” was ineligible for public office—atheist, agnostic, or Buddhist. As an avowed atheist, Silverman was, in fact, the only person ever rejected in his bid to become certified as a notary public. He was finally granted an official notary certificate—seven years later! Silverman opens his biography with a joke, and it’s clear that his sense of humor never falters. A shy and near-silent boy, he found his voice as a college professor of mathematics and in public debates, finally coming “out of the closet” as an atheist. He doesn’t start arguments, he says, but when challenged (and he is often challenged) he meets the challenge with courtesy, relish, and wit. As founder and president of the Secular Coalition for America, Silverman managed to bring together various atheist, humanist, and secular groups to lobby in Washington, DC, and to coordinate activities across the nation. Why? Because atheists, he says, are the only group of Americans it’s still safe to hate. Discriminating against them is still condoned, and the very label “atheist” is considered defamatory. Silverman wants to change this. He has been joined in his efforts not only by other atheists but also by religious leaders concerned about maintaining separation of church and state. Religious and irreligious people alike can learn from this book—lessons about tolerance, freedom of expression, good manners, goodwill, and the importance of not stereotyping—but the lessons are not presented in a holier-than-thou tone, as is often the case in the religion-versus-science debate. Silverman the mathematician is not antireligion, and he isn’t out to destroy faith. All he asks is that people of faith don’t try to deprive him of the rights guaranteed him and all of us under the United States Constitution and the Bill of Rights.